The Churchill range from Mendip Stoves, featuring large curved glass areas, high build quality and the very best in ergonomic and efficient design are the perfect fire for almost any home. With a range of outputs from 5 to 10kW you can be sure there is a model to suit. 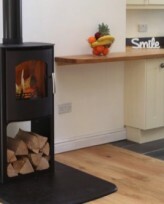 With the advent of timber framed housing and smaller rooms many people have trouble finding a suitable location for their stove but convection stoves can give an answer to this problem, by reducing the distance you are required to keep your stove from walls it can mean fitting a stove in tighter spaces than would normally be possible. 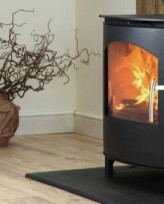 To take advantage of this the 6, 8 and 10kW versions of the Churchill range come with option convection side panels, giving you the ability to place your stove closer to walls that would be possible with standard models but without losing any of the heat, efficiency or good looks that are synonymous of the Churchill model. Every Churchill features a clear glass system, to help keep your glass clean, insulated chambers, for the highest efficiency levels and cool touch handles, to make reloading as easy as possible. 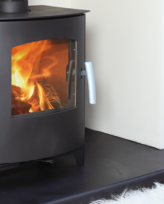 As well as this they all come with a two year guarantee against manufacturing defects meaning you can be sure of a stove that will last.